This article by DailyMail is an inspiring one telling the story of the fearless 19-year-old Raheem Sterling of the Three Lions and Liverpool FC winger, who earned a reputation as a bad boy, fathering a daughter from a brief relationship at the age of 16, making his England debut as a 17-year-old, two years after signing for Liverpool and being England's new hope of lifting the World Cup in Brazil. Like i said earlier this article wasn't written by me so just read and do something meaningful with your life today. England's most encouraging performance against Italy came from the fearless 19-year-old Raheem Sterling. A surprise inclusion in Saturday’s line-up, the Liverpool winger was instrumental throughout. Such dizzying figures are a world away from his troubled youth on one of London’s toughest housing estates. 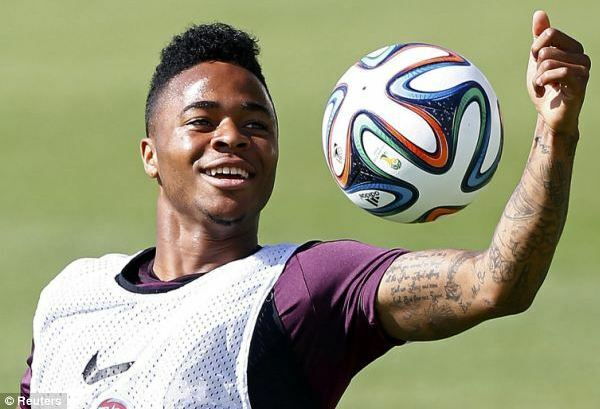 Sterling moved to St Raphael’s, in the shadow of Wembley Stadium, from Jamaica at the age of five with his mother Nadine and three siblings. He was removed from mainstream primary school because of behavioural problems. As prophesised, Sterling made his England debut as a 17-year-old, two years after signing for Liverpool. However, off the field he had already earned a reputation as a bad boy, fathering a daughter from a brief relationship at the age of 16. Last year he was cleared of attacking 19-year-old model Shana Ann Rose Halliday after she declined to give evidence against him. He had already had a common assault charge against him dismissed after a witness failed to turn up to court. Miss Halliday admitted starting the row with Sterling that led to him being charged. ‘We had a heated argument because I had seen a text on his phone and asked who it was [from],’ she said. As with most players, Sterling’s body is covered with tattoos. One piece of body art pays tribute to his mother, who has now moved from London to Liverpool to support his career. During a recent interview, he jokingly described her as his personal ‘Jose Mourinho’, in reference to the outspoken Chelsea manager. Sterling told the BBC: ‘She’s a big part of my life ... she tries to have too much of a say sometimes. I try to listen to her, because most of what she says is right. Sterling did not escape trouble during the build-up to the World Cup, receiving a red card for a reckless challenge in a friendly against Ecuador. Crucially, he kept his head in the heat of Manaus on Saturday night – and could yet guide England to the next round.